In my Novel Technology and Human Behavior course we have an assignment related to a specific novel technology and how it interacts with philosophical ideas and psychological reasoning. So, of course my group member Timmy and I decide to do work on something that is mostly unrelated to actual technology. We decided to look into different metrics for growth. GDP is the current standard for everything. High GDP and GDP growth is currently construed to mean that you have high well being in a given country. However, this is not what the metric was originally designed to measure. So what does GDP measure? It measure most major economic activity. It measures production, hospital bills, and end good sales for example. However, it excludes factors like education, house hold activities and the black market. These are serious gaps. As most people will tell you that have been employed we tend to focus on the activity that is measured. So if you’re at work and you need to get defect counts down or shorten call time for tech support you will do everything you can to make that happen. Even if it’s actually bad for the company you work for. So, if you have high defects you can reduce your measuring frequency to make it look like your defects are better. Or if you’re on a phone call you can be rude and just give the minimum help you can. These are negative results from a measurement. 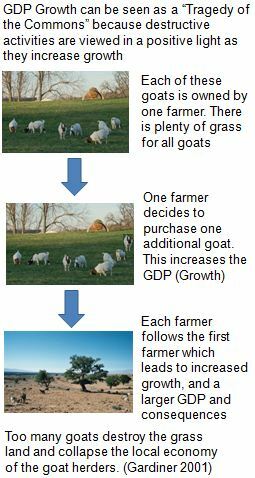 In our poster we argue that something similar happens with GDP. So a tragedy of the common happens all the time. It can be something as inconsequential as replacing the water from a community water cooler. Most people won’t do it because you assume that some one else will. Below is an example of what I mean by how GDP is a tragedy of the commons. Even the collapse of the local economy may be seen as increasing the GDP. As the goat herders are trying to save the land they may slaughter additional goats, buy fertilizer, get some seeds, buy fencing to block off an area so it can regenerate from the goats. All of these things are seen as beneficial to the economy when it is actually very destructive to this aspect of the economy. So what can we do about it? Well there are some different metrics that can be used to measure well being while taking into account sustainability, such as Green GDP. China actually attempted to implement this, but decided against it as it lead them to have smaller growth numbers and may have put them at a competitive disadvantage. Timmy and I believe that some good ways to deal with this, is to focusing on what is preventing people from adopting more sustainable technologies, and then trying to create incentives to drive further adoption. We’re finding that this problem is a bit of a catch-22, you can’t get people to adopt the different measurements without people adopting green technologies, but you can’t get huge investment in green technologies without incentives from a new indicator. This entry was posted in Economics, Politics and tagged Economics, GDP. Bookmark the permalink. Wasn't there also a way of calculating a better measure of productivity.. I believe it is Net savings (GDP-depreciation=NDP-depletion of (natural) resources=Net savings) but i could be wrong about the name. We covered this in development economics so maybe Timmy can comment on that as well. I haven't seen anything about netsavings. We didn't cover that in MST, but I think it's still missing the benefit of green energy and sustainable activity. I understand what you're saying though. I'm basically just acknowledging that there is a problem and saying that there are alternative measure that may address the problem.